The actress Irmgard von Hansen only took part sporadically in front of the camera. Her first movie was "Geopfert" (16) directed by Walter Schmidthässler with Olga Engl, Grete Weixler and Bruno Ziener. In this movie she played the role of Irma Büchner. In the same year she took part in the production "Die grüne Phiole" (16) with Theodor Loos, Lupu Pick and Walter Wolff. Walter Schmidthässler was the director again. Afterwards Richard Oswald engaged Irmgard von Hansen for the role of Ingrid in his big production "Peer Gynt". 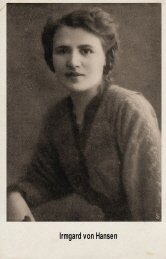 To her film partners belonged Heinz Salfner, Ilka Grüning, Anita Berber, Conrad Veidt, John Gottowt and Maria Forescu.